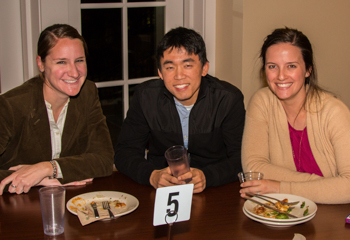 On November 20, the Residential Life program hosted a Thanksgiving dinner for the St. Anne’s-Belfield School community. Faculty and staff brought their family members to enjoy a meal of turkey and trimmings with the majority of the School’s 62 boarding students. The evening began with a prayer written by Michael Mao ’15, and led by YiYi Wei ’15. Following a buffet-style service, guests enjoyed an evening of conversation concluded with traditional pumpkin pie. This post was written by STABCandM on Friday, November 21, 2014, 12:33. STABCandM has written 175 posts on this blog.